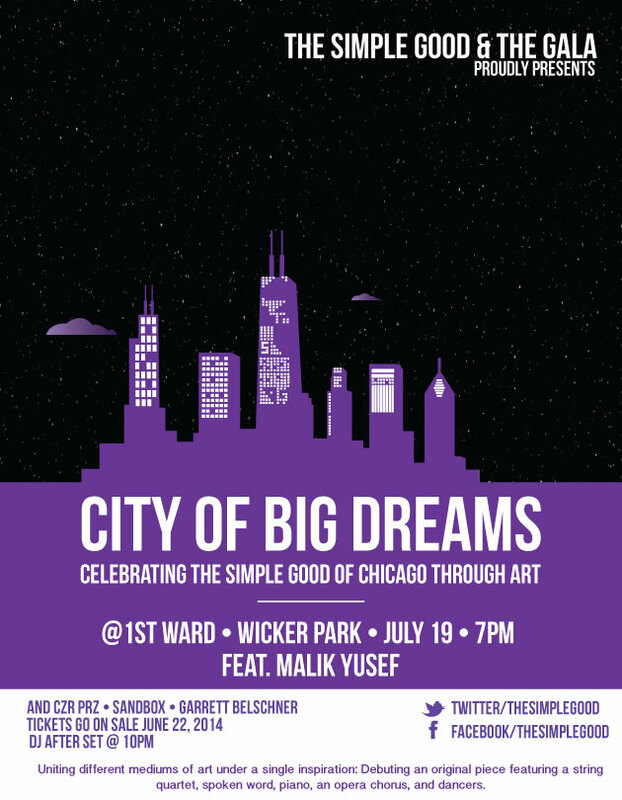 The Simple Good and The Gala present "City of Big Dreams" - a collaborative pop-up showcase uniting five different mediums of art under a single inspiration, "the simple good of Chicago." The evening will debut an original piece, featuring Chicago's own Grammy-Award Winning Spoken Word Artist/MC Malik Yusef, and Chicago's own International Street Artist, Czr Prz, uniting with Reggie Eldridge (RJ El), a string quartet, piano, an opera chorus, and dancers to perform under a single inspiration - the simple good of Chicago. The evening will be joined by the Sandbox Network who will be celebrating Sandbox's first Chicago Hub Launch and a DJ after-set with The Silver Room's Block Party to follow. Through the event we celebrate not only the talented local artists Chicago holds, but also the rebirth and transformation of the city which encompasses the good that surrounds us. Through a curated selection of street artists, poets, musicians and dancers, we demonstrate the strength and inspiration that has begun to transform "The City of Big Shoulders" to a "City with Big Dreams." Proceeds of the event benefit the simple good, a Chicago based non-profit focused on connecting the meaning of good from around the world through public art projects and art programming in schools in at-risk areas in Chicago, as well as supporting local Chicago artists.